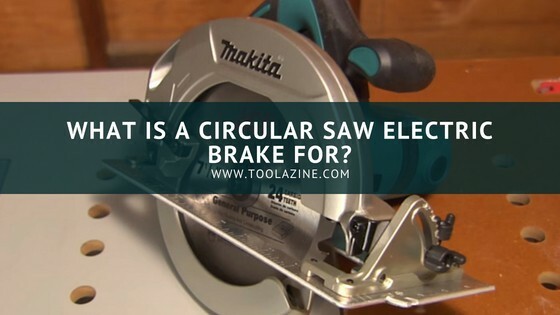 Toolazine What is the purpose of a circular saw electric brake? What is the purpose of a circular saw electric brake? The power source and design aren’t the only things to look for when buying a circular saw. For safe and efficient operation, it is crucial to check and understand its features. Ever wondered what is the purpose of a circular saw electric brake? An electric brake is activated by releasing the circular saw trigger. When activated the electric brake reverses the electricity flow and stops the blade almost instantly. It makes the saw safer as the blade is quickly stopped from spinning soon after the trigger is released. This feature is often very underrated, although it can be life-saving in some situations. How long does it take the circular saw blade to stop spinning? Why is the electric brake so important? If you want to start with woodworking, a circular saw is the first tool you need to consider. This power tool uses a blade that spins around an arbor and you can use it for straight cuts. More info: What is a circular saw? However, this tool has many features that make the cutting easier and productive. In this article, I will only stick to one of the systems that people often forget to mention. The science behind this feature is not so difficult to explain – you just pull the trigger and the blade stops much faster than it would stop when it is left on its own. A simple process that brings many advantages. I guess that the engineers that build this system probably won’t agree that it is a simple feature, however, for you as an operator, there is nothing more you should worry about. Every model is different, but generally, it would take up to 12 seconds for the blade to stop spinning after you have finished the cut. That seems like a short period, but for that time the blade could damage the material or even cause an injury. And how many long does it take to stop a circular saw blade with an electric brake? Only 2 seconds, which is 6 times less. This makes it a lot safer and means that you can save waiting for up to about 10 second per cut for the saw to stop spinning before putting it down. Manufacturers came up with many other solutions – shaft locks, bevel stops and so on. Why is the electric brake so important? Is it just about the safety? Safety should always be your first priority – especially when you are playing with big toys like the heavy-duty circular saw. For that reason, manufacturers often various features in order to increase the safety of the operator and electric brake is one of their very best. Forget about damaging the blade or the material (even though those could cost you much) – the electric brake could save your fingers and that is way more important. However, this feature won’t help much if you don’t follow the rules and use the circular saw in a right way. Imagine that you are cutting wood and you need to wait until the blade stops spinning so you can make another cut. Occasional cutters may won’t experience this problem, but for professionals that make hundreds or thousands of cuts, this could be time-consuming. Not only that is a safety feature, the electric brake can be a productivity booster, as the time between two cuts can be reduced dramatically. Once you finish the cut, pull the trigger that activates the electric brake and start your next cut sooner. Many manufacturers implement this feature in their models. I did a research and there are several models from the most famous power tools companies that you should definitively consider. This company released 2 circular saws at a time – DeWALT DWE575 and DeWALT DWE575 SB. However, the only difference between them is just one feature, the second one has an electric brake. How that influences the operation, you can see on the video below. Said to be the only circular saw you will ever need to buy, the DWE575 SB has proven to be more successful than its twin. A lightweight, well-balanced circular saw that comes with an electric brake – what else can you wish for? It has a durable design and although it is small, it is very powerful. With 5100 RPM, it is the ideal saw for framers, contractors, and remodelers. If your main activities include cutting plywood, framing walls and exterior finishing, you should definitively consider this one. It has nice ergonomic handles, 57-degrees bevel capacity, as well as an integrated dust blower. Already made your pick? Check the price of the DeWALT DWE575 SB here on Amazon. Makita did the same as all of their competitors – they included the electric brake creating a powerful and tough machine that could cut through anything. Very soon, the Makita 5007MGA became one of the best-selling models. Don’t believe me? Take a look at this video. Makita succeeded in creating powerful and durable engine best for framing walls, floors, and roofs. Since the parts are made of magnesium, it is a lightweight tool as well. It has a maximum bevel capacity of 56 degrees, LED light, a dust blower, and a greater clearance between the rear handle and the blade case, in case you have bigger hands or you wear gloves. Durable, powerful and efficient circular saw with an electric brake, what do you need more? Check the price and customer review of the Makita 5007MGA here on Amazon. Have you heard about Rockwell? It provides innovative, quality power tools. And implementing the electric brake is one of their newest innovations. To get a better view of Rockwell RK3441K performance, take a look at this video. This is a very powerful and functional circular saw that could replace most of the conventional circular saws of its size. Although it is a lightweight machine, you can cut sheets with it with the same ease and comfort as you would with a bigger saw. Since it is smaller, you can operate it with just one hand. Quick and accurate cuts, increased maneuverability, plunge cuts and rip-cuts, if you are still looking for a circular saw, don’t forget about this one. Plus, it has an electric brake. Buy the Rockwell RK3441K here on Amazon. In conclusion, the purpose of a circular saw electric brake is not just safety, but also improved productivity. Since this is a very important feature, you need to consider it before choosing your circular saw. What is your opinion on the electric brake? Which model do you prefer? Feel free to post your answers and share this article with your friends. Related: What is a circular saw base plate / shoe?